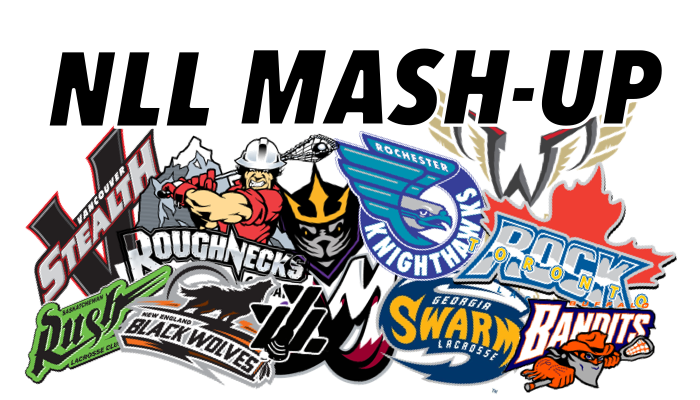 YumYumLax, NYC: [NLL MASH-UP] WEEK 14! Without question this was the most exciting weekend in the NLL this season. All three games were decided by a total of three goals, two were in OT. IMO all three games had playoff intensity. It looks to be a wild final third of the season, especially in the East where the entire division is within two games of each other. By the end of the game LYLE was left bloodied by BILLY DEE SMITH, which resulted in a 5 minute major power play. However, LYLE came out of the locker room and finished the game strong. I love watching his relentless style of play. His stats are not as prolific as last season, but he is still a massive factor for the SWARM. He has recorded 4 points in each of the last six games. In fact he has scored at least 4 points in all but one game this season. His shooting% has dropped to 14% from his 19% last versus year. Don’t count out the SWARM in the East race. We talked early in the year how we felt that JAMIESON would get better as the season went along. That is the case as he has been the driving force in ROCHESTER’S 4 game winning streak. Over that time has 11g, 16a. Others like RESATARITS and SHANKS have also been playing well, but JAMIESON is the leader out the front door for ROCHESTER. The rugged lefty has taken the lead in my opinion for Defensive Player of the Year. He has the stats out of the back end with 5g, 5a and 99lbs. But, when you watch the games he is all over the floor causing problems for the opposition. The KNIGHTHAWKS have the most physical defense in the league. HOSSACK has that physicality combined with a lethal transition game. I’ve been watching NLL games for a number of years, and have yet to see so many great goalie performances in one week. NICK ROSE and STONE COLD AARON BOLD were brick walls for their teams in TORONTO. It was a shame one of them had to come out a loser as they matched each other with 51 saves each. Same can be said of MATT VINC (38 saves) and MIKE POULIN (46 saves) in the ROCH/GEORGIA game. After digesting the EVANS / CRAWFORD trade a few things to think about. Despite denials there was obviously a rift between EVANS and The BLACKWOLVES coaching staff and (or) front office and(or) other teammates. You don’t strip your franchise player of the (C) without a major issue. Just think if a ZDENO CHARA or a SIDNEY CROSBY ever had that happen, it would be major news. The lack of coverage and interest shows us how far the lacrosse media in general needs to go to be relevant. Let’s look at the trade on face value as a pure lacrosse trade. I think the BLACKWOLVES did a pretty good job and got a solid return for their former future HALL OF FAME captain. The trade is more of a head-scratcher from a BUFFALO point of view. When I saw the BANDITS in person, the thing that stood out was their size and athleticism on offense. Taking away CRAWFORD from that equation and replacing him with EVANS takes that dimension away to a certain point. EVANS has to be considered the best player in the trade, But, for BUFFALO to take him on is a little risky. How will he fit in with an offense that had been hitting on all cylinders in recent weeks? How will he work with DHANE SMITH on their right side? The BLACKWOLVES on the other hand seemingly has much to lose as well. EVANS and KEVIN CROWLEY have carried the offense pretty much all season. EVANS is a supreme competitor and led them into the playoffs last year. If they don’t make the playoffs, management will have some egg on their face dumping the franchise player. Also, CRAWFORD is a free agent at seasons end, where EVANS is signed for a couple more seasons. Both players are in their early 30’s. Also, NEW ENGLAND gets a much needed draft pick in the deal. Time will tell to see what that part of the deal turns into. From a statistical point of view it’s a wash in 2018. In the early returns CRAWFORD had 1g, 2a in his debut versus the ROCK, while EVANS had 1a in his BUFFALO debut. Also, EVANS has 5 MANN CUPS and a CHAMPIONS CUP, where CRAWFORD doesn’t have any. I don’t think I would have may the trade if I was running either team. At the end of the season I bet one team will be very happy and one will be bumming! I do think it took a lot of guts for the NEW ENGLAND front office to make this move. For the first time all season we were shut out 0-3! All three, one goal games, could have went the other way….but didn’t. We are still a 30-21 for a solid 59%. These picks just keep getting tougher and tougher as things tighten up, especially in the East. Friday I will go with SASK over BUFFALO, how can you pick against the boys in green? The will be looking for revenge as the BANDITS upset them last time out. Also Friday, I will take the BLACKWOLVES over TORONTO. The ROCK has only scored 27 goals and have gone 0-3 since TOM SCHREIBER went down. Which BLACKWOLF team will show up? If they play with the defensive intensity and get the goaltending they will hold serve at home. KEVIN CROWLEY and CO will score just enough to keep them in 1st. On Saturday, I will choose CALGARY over ROCHESTER. Reason being the HAWKS are just due for a loss. I will also pick COLORADO over VANCOUVER, can’t pick the one win team at home. Although they will win one of these weeks…I think! The lone Sunday game I will go with BUFFALO over GEORGIA. I can’t see the BANDITS going 0-2 for the weekend. If they beat SASK I would change my pick to the SWARM.